The United Launch Alliance Atlas 5 rocket that will boost NASA’s latest communications relay satellite into space is targeting an Aug. 20 liftoff at 7:56 a.m. EDT (1156 GMT). 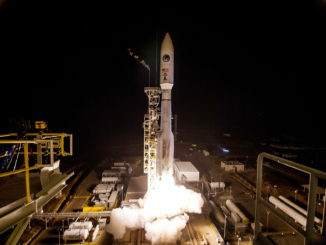 The Tracking and Data Relay satellite-M, or TDRS-M, will be carried aloft from Complex 41 at Cape Canaveral Air Force Station in Florida, reaching a customized high-perigee geosynchronous transfer orbit nearly two hours after launch. The mission was delayed from Aug. 3 after a crane incident damaged the craft’s Omni antenna in the cleanroom, requiring replacement. 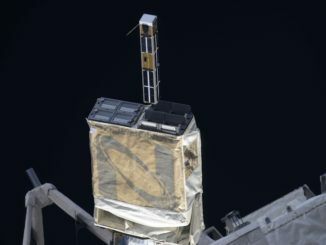 The spacecraft will act like a relay station 22,300 miles above Earth to receive telemetry, voice, video and scientific data from lower orbiting platforms — like the International Space Station and Hubble Space Telescope — and beam the signals to a central ground hub. The satellite will become the 12th TDRS placed in space since 1983 and extend the constellation well into the 2020s, providing near continuous connectivity to spacecraft that would otherwise be in range of ground stations 15 percent of each orbit. The two stages of the Atlas 5 rocket arrived by sea on June 26, sailing into Port Canaveral from the manufacturing plant in Decatur, Alabama, aboard the Delta Mariner cargo ship. On Wednesday, July 12, United Launch Alliance workers began stacking the launch vehicle, designated AV-074, by erecting the first stage aboard the mobile launch platform parked inside the VIF. The combined interstage, Centaur upper stage and boattail of the fairing, all pre-integrated together off-site, was hoisted atop the first stage on July 13. The 191-foot-tall rocket will be wheeled to the pad on Aug. 18 at 9 a.m.